How is the Productivity Level calculated? 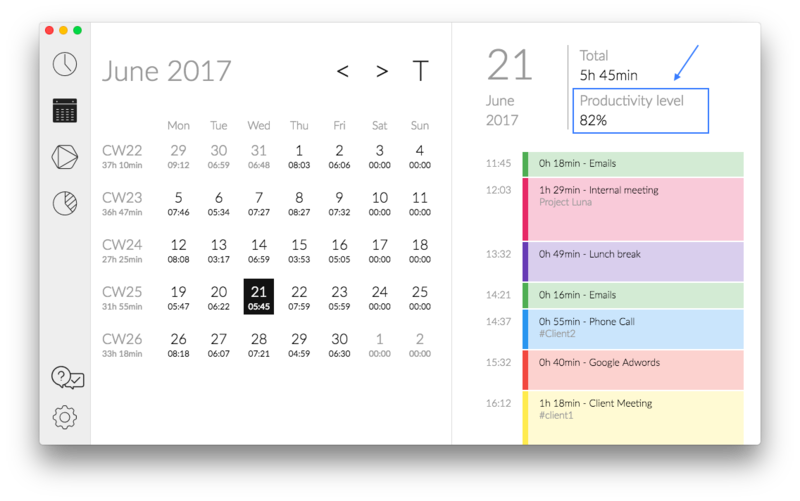 All you need to know about the productivity level that you find on the right side in your calendar. You may have wondered what the productivity level in your calendar on the right means. We all are humans and not machines, therefore a productivity level above 60% is already a pretty good value. Being more productive doesn’t mean to work more, instead for us it means, working smart and achieving goals with the least effort possible. The formula for calculating the productivity level is still in development. The productivity level has been developed by us and is influenced by different factors that are calculated based on your tracked data. While 40 hours/week is the common standard, we believe that working less than that has a positive impact on productivity and countries like Sweden or the 5-hour work-day project have proven that. Getting into the flow of a task requires time. If you get interrupted or distracted by switching to something else shortly after you’ve started working on a task you will be way less productive. Another common term for this is multitasking which is known to cost you 40% of your productive time because our brain is not designed for multitasking. Therefore we take the duration of tasks into account for the productivity level. When you go to the statistics section in our app you will see the percentage of your short, medium and long entries. Short entries are below 15 minutes, medium from 15 - 60 minutes and long entries above 60 minutes. Your goal should be to focus on one task and assure you can’t get interrupted or distracted, so you can work on tasks for longer than just a couple of minutes. Of course, there are tasks which will not require more than a couple of minutes. Therefore we know, we have to improve our formula here which we are currently doing. This is just a start. Starting and ending your work day more or less always at the same time has a positive impact on your productivity as this will create a routine which your brain can get used to and it becomes a habit. It doesn’t have to be 9-to-5. It should be the time you feel most productive. Your goal should be to identify that time and concentrate your work hours on that timeframe. We hope this helps to understand your productivity level. As we said earlier - everything above 60% is already pretty good and you shouldn’t aim for 100%. Actually, no-one can get there. But if you take a couple of things into account that we mentioned, you are very likely to get close to 80% or even above.